Tourism in West Papua is an expanding industry but it brings with it the potential to exploit indigenous West Papuans, both culturally and economically. Virtually all tourists who come to West Papua travel to the Baliem Valley in the highlands. The main town, Wamena, draws tourists who are interested in trekking and in the culture of the local Dani tribes. Unfortunately, that interest in the culture is often exploitative, and the Indonesian administration of the tourism industry is mostly concerned with economic return. Tourists are mostly Dutch and German, with Australians conspicuously absent, probably due to the minimal press West Papua attracts. Most tourist money goes to Indonesians who run the losmen, hotels and small businesses, While the local Dani people can only earn cash through petty trade at the vegetable market or by haggling with tourists over everything from the price of a photo to their occasional work as guides. 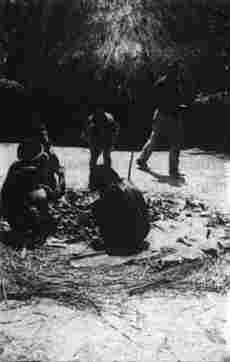 The indigenous people are treated as objects of curiosity. Although the Indonesian administration has previously tried to force them to wear clothes and live a more "civilised" lifestyle, today they are happy if they go naked because it is good for tourism. Nowadays, when villagers can afford it, the custom is to sport modern dress, cotton shorts, t-shirts and dresses. Government policy, the missionaries and now tourism have taught the locals to see traditional dress as backward, something to be ashamed of. In the village of Manda for example, clothed villagers are barred from the village while near-naked tribes-people, well-rehearsed and divided into two twelve-member teams, cook and dance in the traditional way for camera carrying tourists. The tourists pay for the food, the dancing, the photos, some handicrafts and a night's accommodation. The next day, after the tourists have left, the villagers climb into their clothes again clothes bought using the profits of tourism. The question all of this raises is: is this preserving or demeaning local culture? Biak, an island off the north coast, receives luxury liners because it is one of the world's best diving spots. A five star resort opened there in 1992, laying the groundwork for direct QANTAS flights from Australia, with a golf course, marine park and five luxury hotels. Tourism can provide opportunities for indigenous people to obtain cash and develop their livelihood, while respecting their tradition. The village of Dukun for example, man- ages its own co-operative venture formed to profit from tourism, yet helps them feel pride in their culture. Here, self-determination helps to sidestep the culture shock. Tourists can stay in a village, completely built by the co-operative to house visitors, for Rp 3000 (A $2) a night. The villagers will dress traditionally, dance and have a feast for paying tourists. Tourism can be in keeping with the dignity of indigenous people and can help them to feel pride in their traditions. 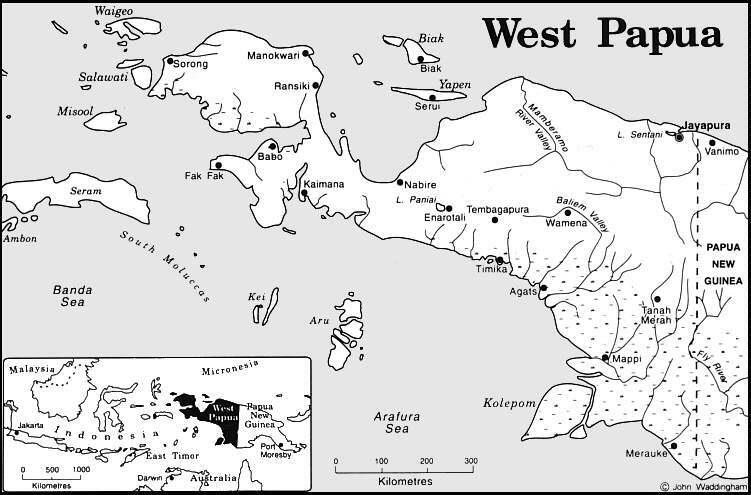 You can visit West Papua and discover for yourself the uniqueness of the country's environment and people. Helpful resources are Kal Muller's book Indonesian New Guinea, and John McCarthy's booklet, (plus discussion guide, especially designed for educational use), Are Sweet Dreams Made of This? (see Reference section). "Control by indigenous peoples over developments affecting them and their lands, territories and resources will enable them to maintain and strengthen their institutions, cultures and traditions, and to promote their development in accordance with their aspirations and needs."